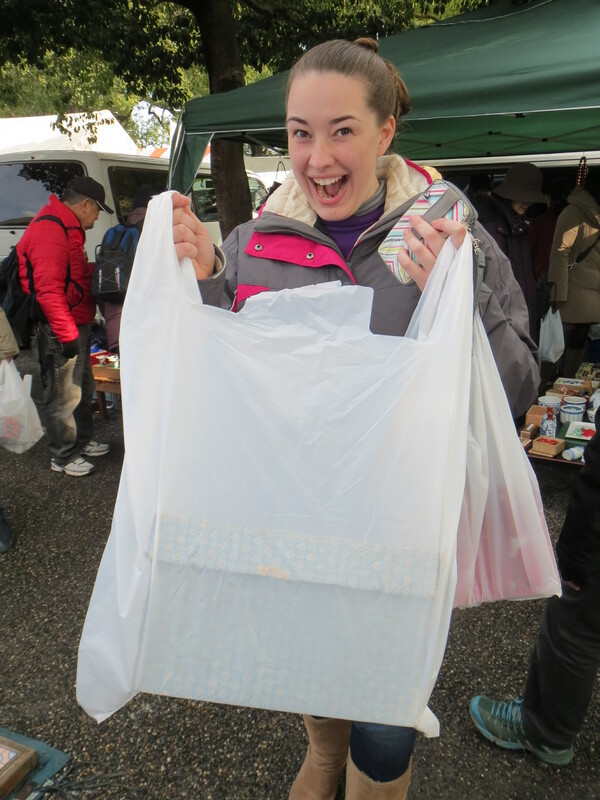 To-ji Temple Flea Market | Ready, Set, Kimono! 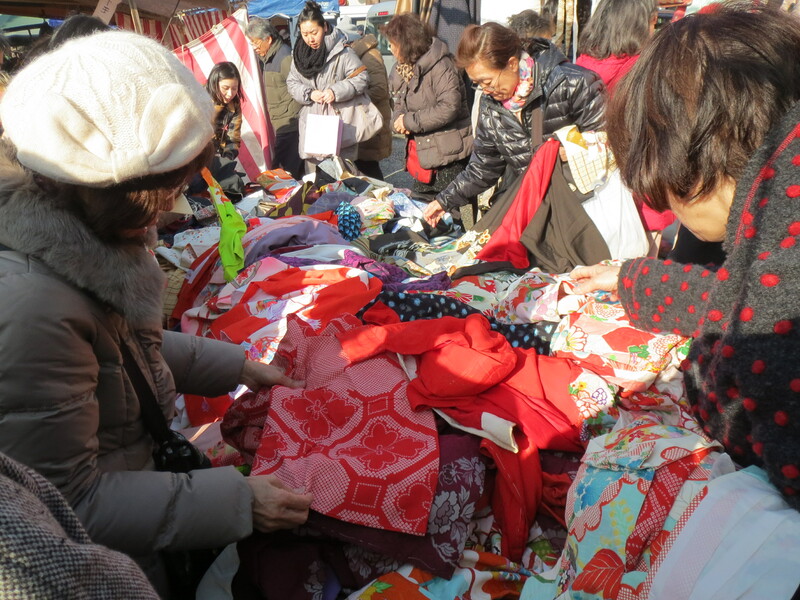 The To-ji Temple flea market is one of the biggest flea markets in Kyoto. 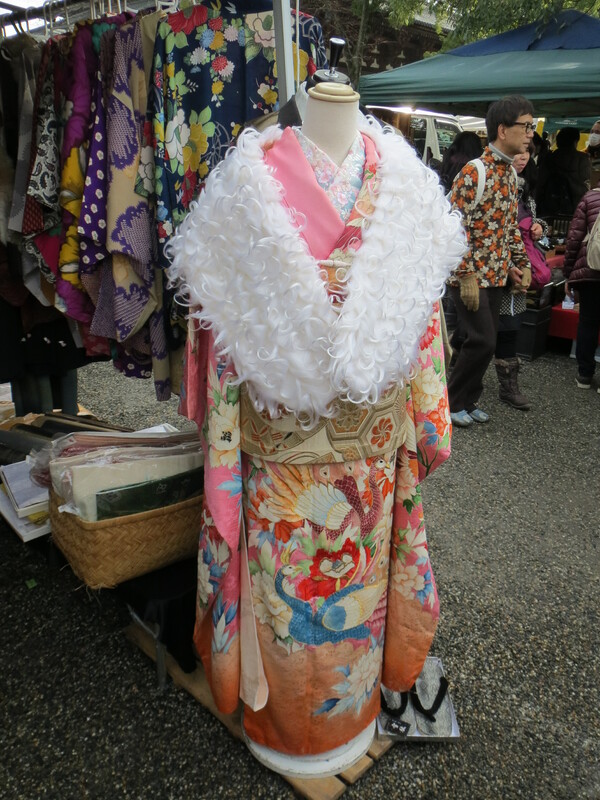 It’s a great place to find some bargain kimono, obi, and accessories, as well as other weird and wonderful things. My first time stepping through the temple gate and seeing the size of the compound and the flea market. I can’t talk about the flea market without talking about the temple too. The two are interconnected, and I’ve always loved visiting temples and shrines. To-ji means east temple (東寺) and it was originally part of a pair of temples to guard the capital from evil spirits. The other temple was called Sai-ji (west temple 西寺). They stood on either side of the large Rashomon gate that marked the southern entrance to Kyoto. Unfortunately, both Sai-ji and Rashomon no longer exist. 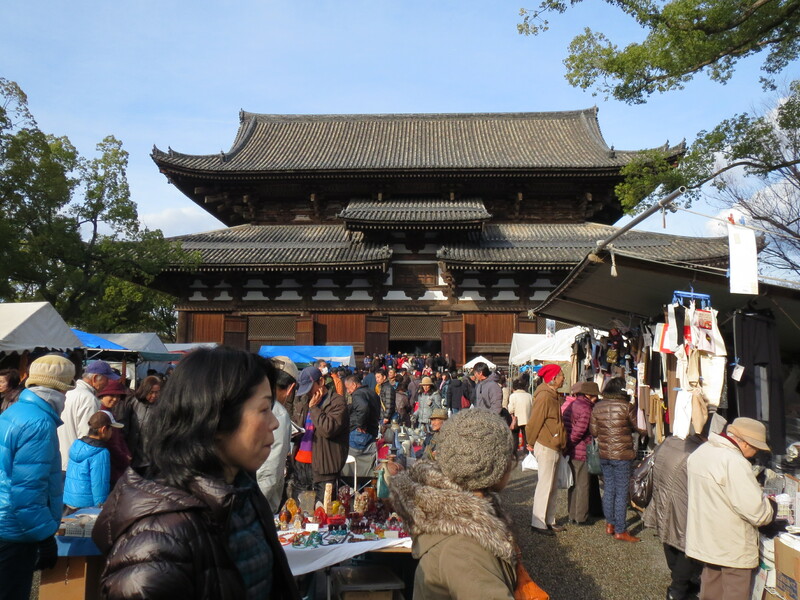 The main temple at To-ji with the flea market in front. Construction on To-ji began in 796. By the year 823, construction still wasn’t completed, so Emperor Saga asked the influential monk Kukai (空海)to administer the temple and complete the building project, which he eventually did. He included plans for a five-story pagoda that would be the tallest in Japan. This pagoda, unfortunately, doesn’t survive. 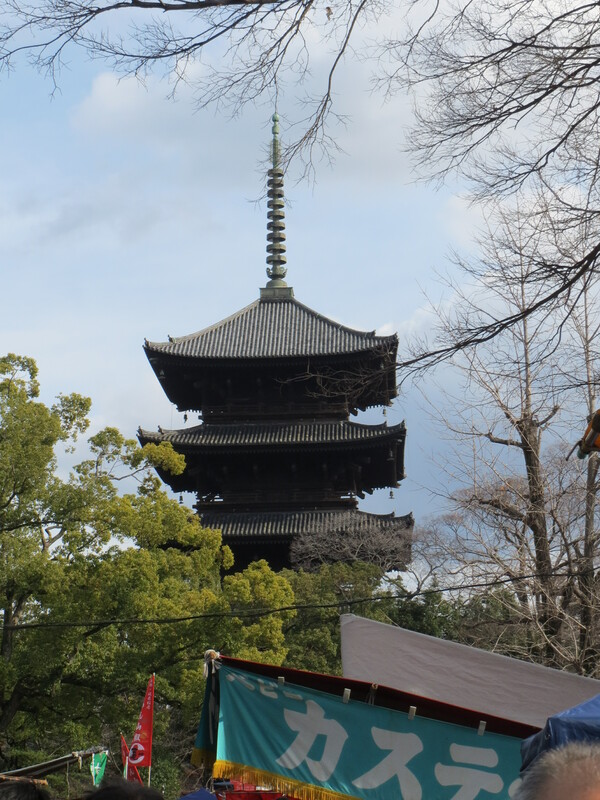 The pagoda that is currently on the site was built in 1644.
the current pagoda at to-ji. 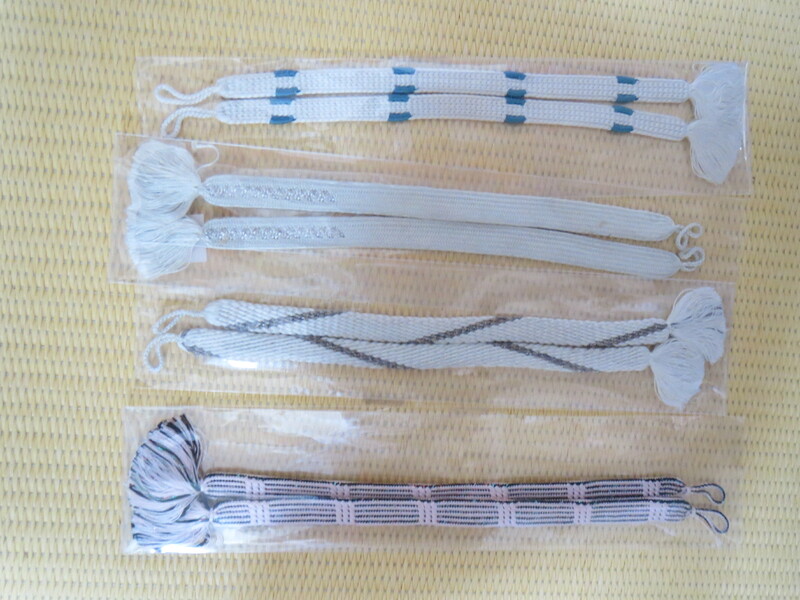 Kukai was responsible for several things during his lifetime. He founded a new sect of Buddhism called Shingon Buddhism. To-ji Temple, Kukai’s retreat on Mount Koya, and the 88 temple pilgrimage on Shikoku, are all Shingon Buddhist temples. The 88 temple pilgrimage is a circle of 88 temples around the island of Shikoku. Traditionally it is walked, but it is also perfectly acceptable to drive, bike, or take a tour bus. 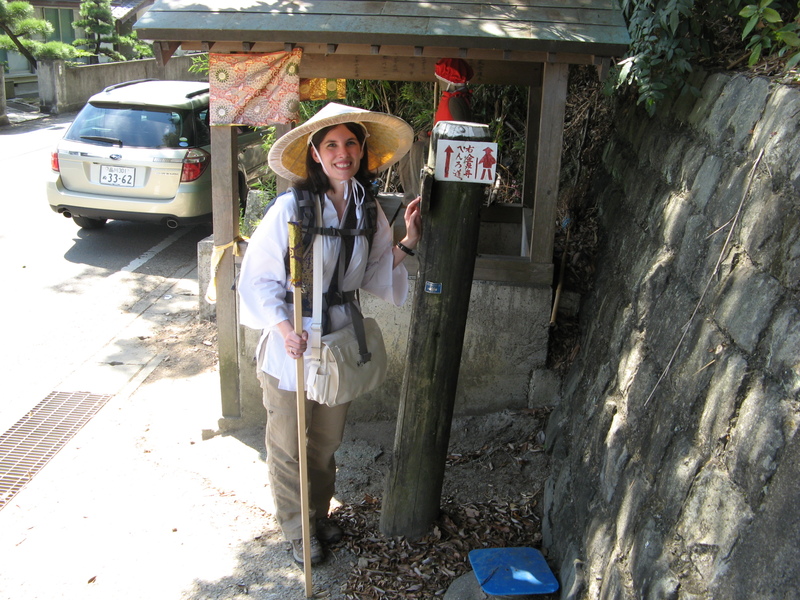 When I moved to Shikoku in 2009 I started the pilgrimage. Just over a year later, I completed it. It’s an accomplishment that I’m very proud of and I have very fond memories of it. Because of this, Kukai and his temples (including To-ji) have a very special place in my heart. Me at the beginning of my pilgrimage. I’m standing next to a signpost guiding henro (pilgrims) to the next temple. 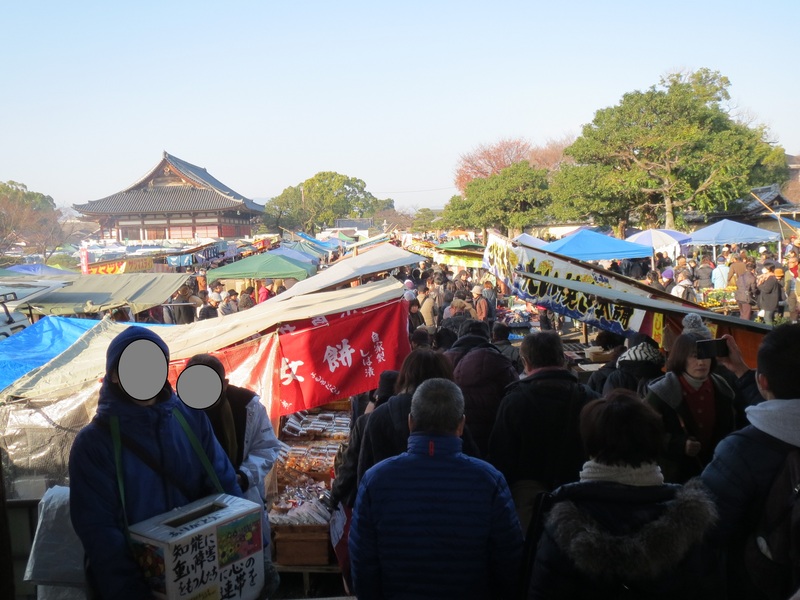 The To-ji flea market is held on the 21st of the month in order to honour and commemorate the death of Kukai who died on the 21st of the third month in 835. 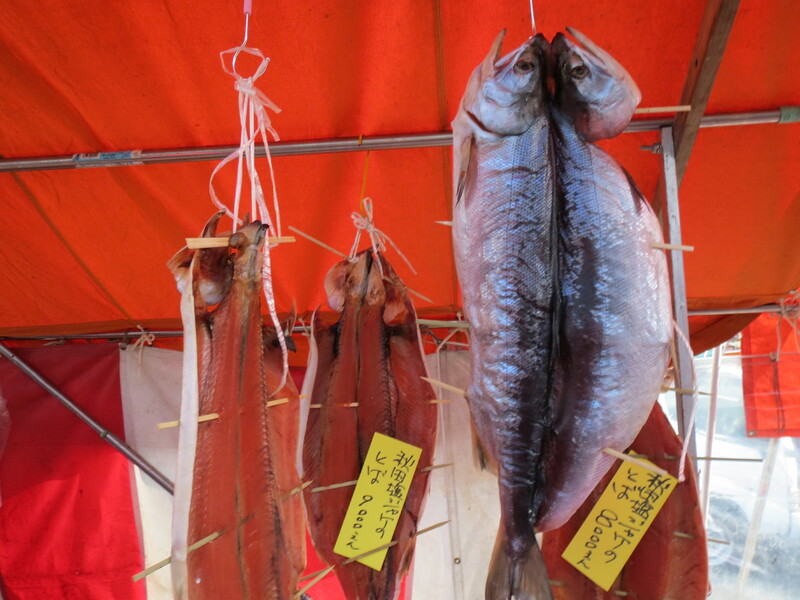 Locally, the market is known as Kobo-san. The name is taken from Kobo Daishi (弘法大師) Kukai’s posthumous name. 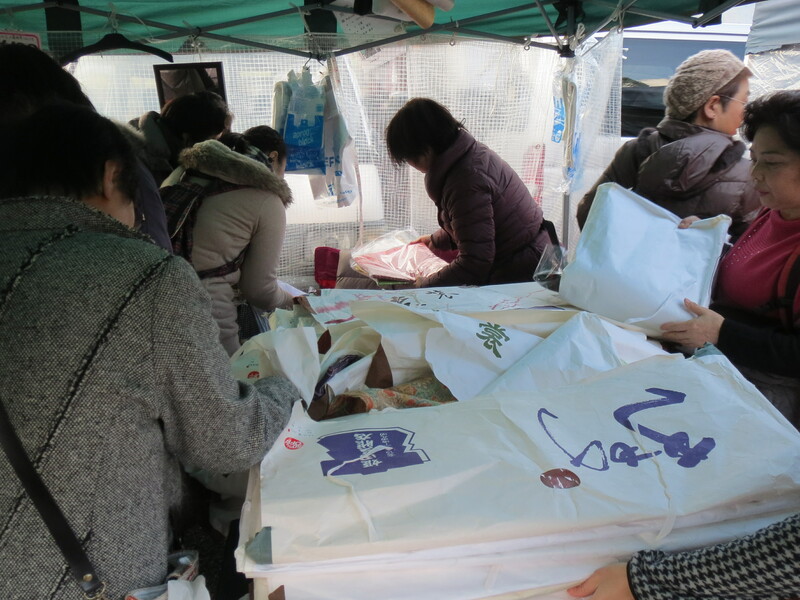 The market runs from dawn to dusk, but usually wraps up around 4:30. The biggest market of the year is the one in December, and this year, luckily, the 21st fell on a Sunday so I leapt at the chance to go! Of course, I was on the lookout for bargain kimono. Most of the sellers had their wares in a jumbled heap in the middle and it was a free for all. 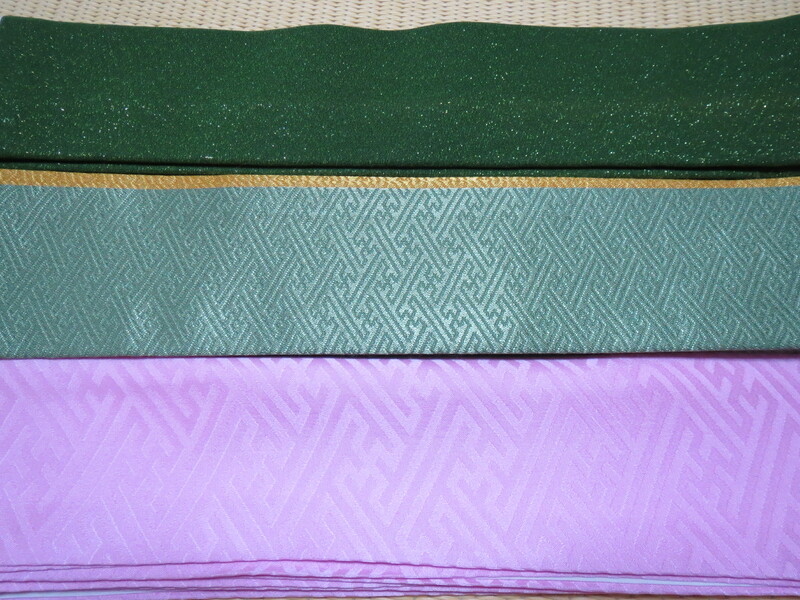 Other sellers had all their kimono wrapped in tatoshi. I didn’t stay long at these booths because it was really hard to look through everything. 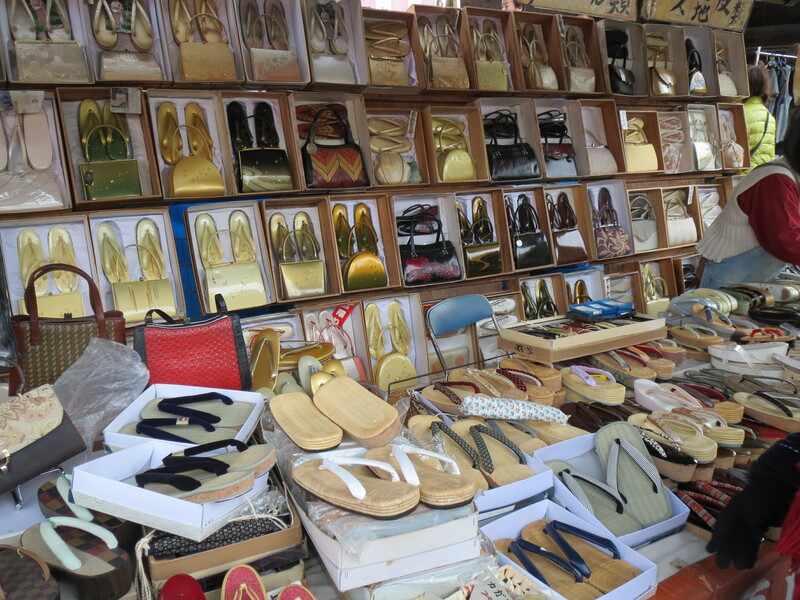 This merchant was selling geta and zori. She also took custom orders. I love this one because the fur wrap looks like Santa’s beard. There were also a ton of weird and wonderful things that were not kimono on sale. 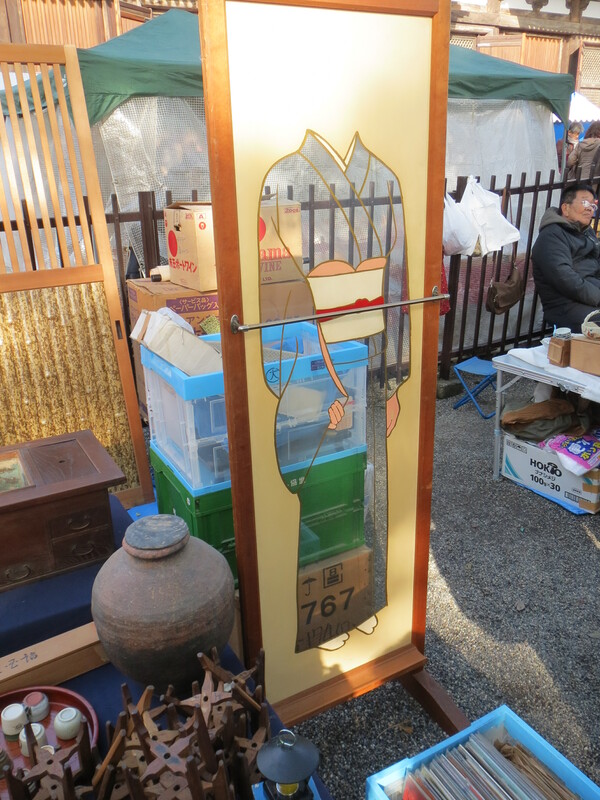 This is a window in the shape of a kimono. I couldn’t quite figure it out. 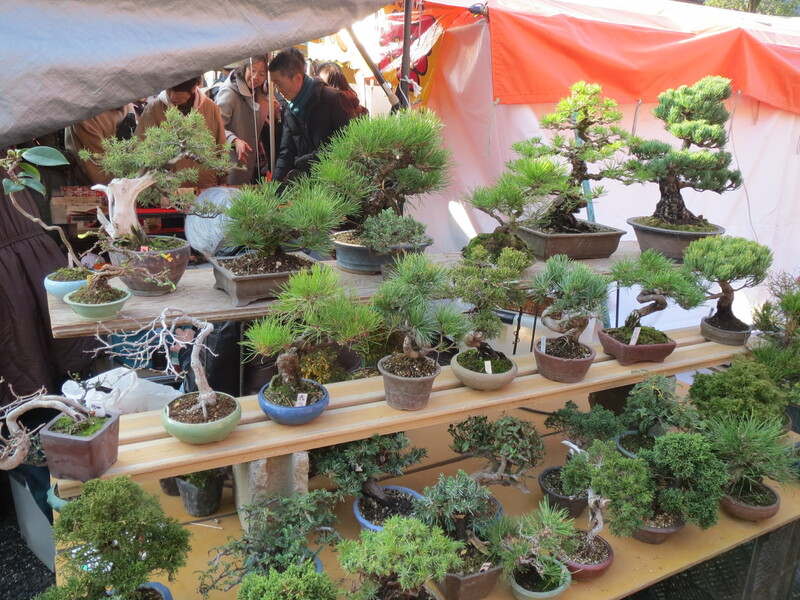 Bonsai on sale. There was an entire section devoted to plants and gardening. Lunchtime! 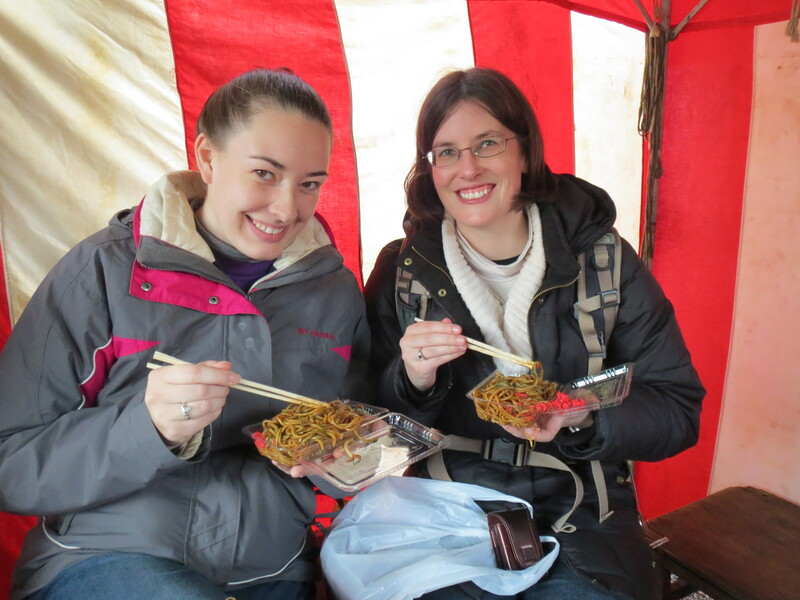 Some yakisoba really hit the spot and charged us up for the rest of the day. 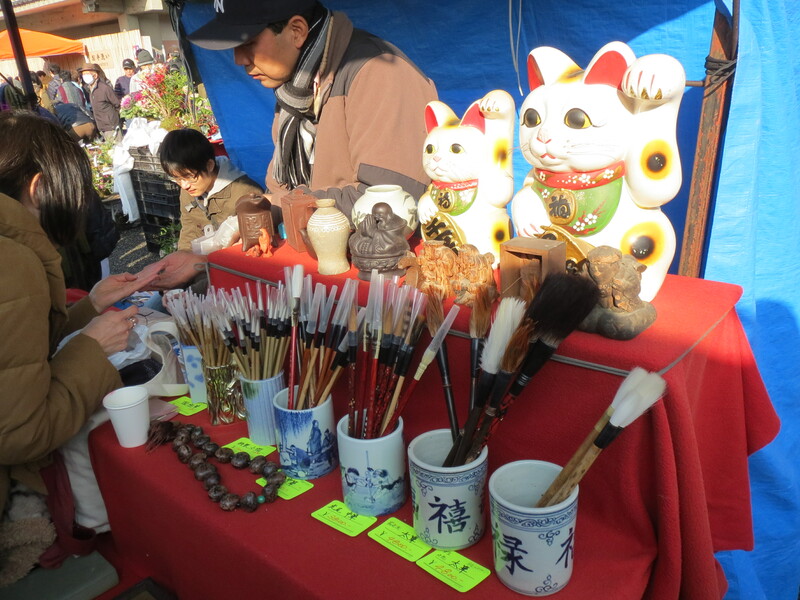 Maneki neko (waving cats) and calligraphy brushes on sale. Anybody looking for a cannon to furnish their living room? As you can see, we did alright. 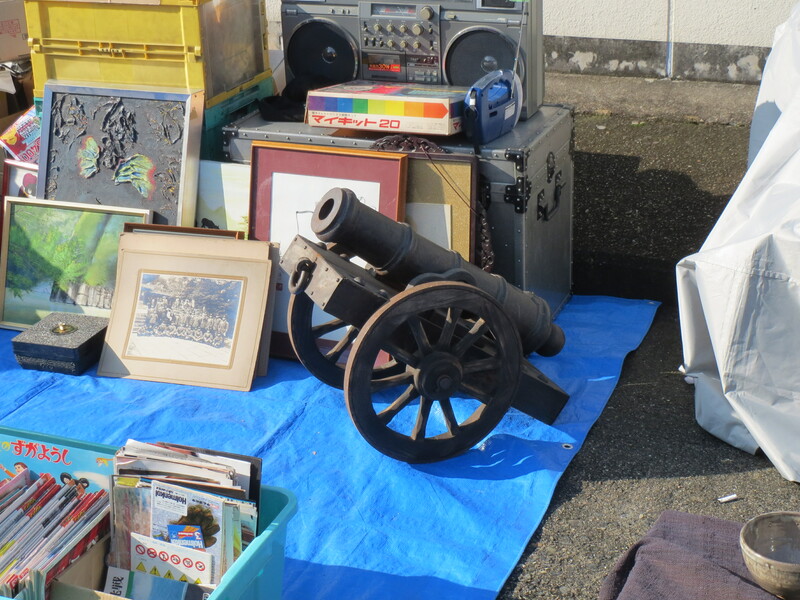 We can’t agree on who won the flea market because we both love what we bought. Now for the goodies! Final cost, 5200 yen. 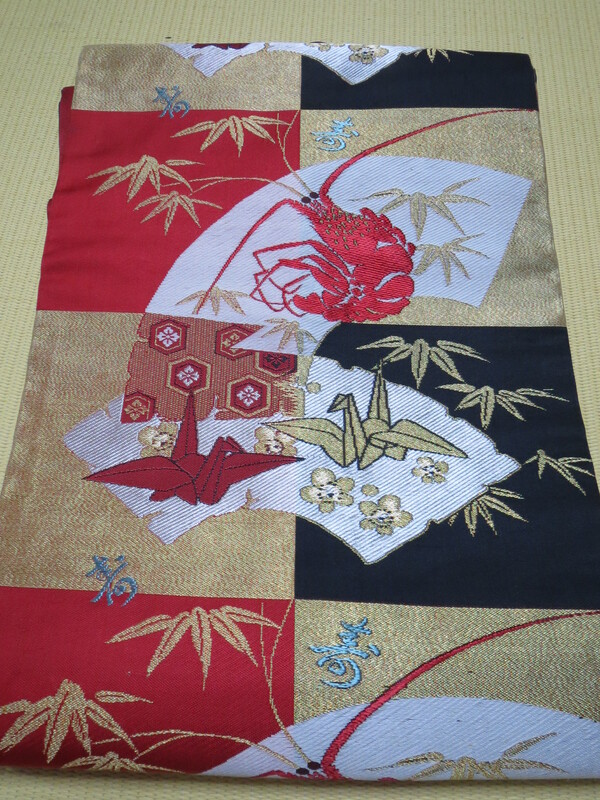 A nagoya obi with lobster and origami cranes. This was my first purchase of the day and I love it! 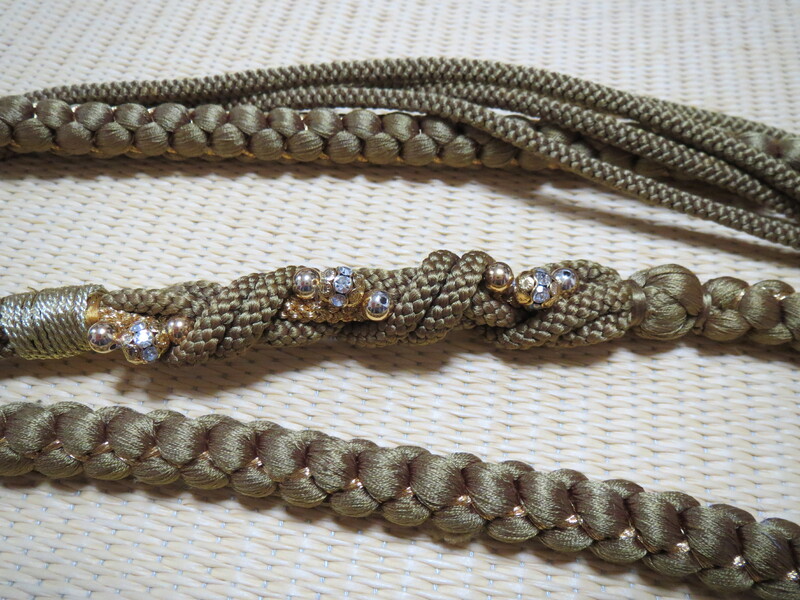 A second nagoya obi. This one was only 300 yen. Three date eri. I’m trying to expand my collection. 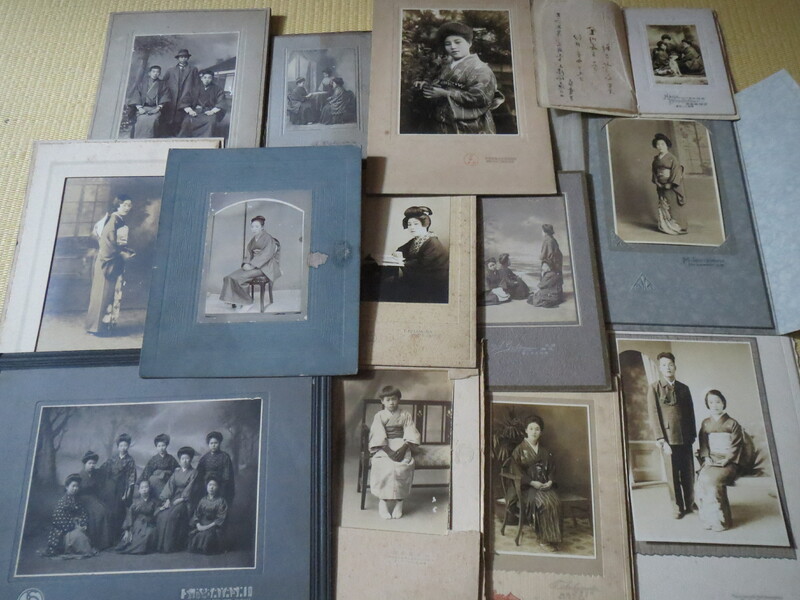 A collection of old photos with kimono. They were 100 yen each, but I was only charged 1000 yen for 15 photos. What a deal! My one purchase unrelated to kimono. 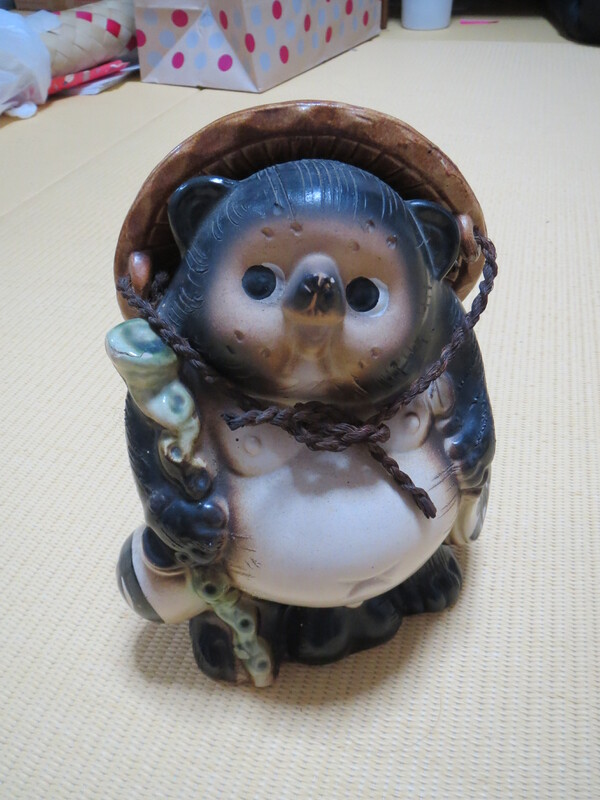 This is a small statue of a tanuki. Maybe the window was from a tanmonoya? 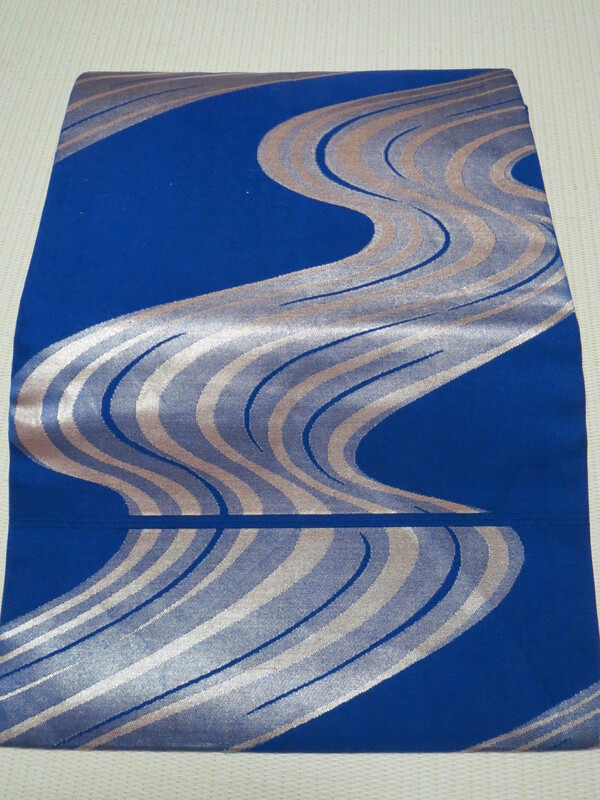 Put the bolt of fabric suitable for kimono into the window without cutting it, and then when it’s sold or when it’s time to display a new one, roll up the old one and unroll a new item. Wow, I didn’t even think of that! What a great idea for the shops. Thanks for the info!